A warm Irish welcome awaits you at the bar, Inis Mór’s meeting and eating place in the heart of Kilronan on the Aran islands. One of the nicest bars in Inis Mór on the Wild Atlantic Way, a location with a front patio overlooking stunning harbour views. The bar in Inis Mór offers a wide range of traditional Irish food serving breakfast lunch and dinner daily in our restaurant from 1030am till 930pm. Our best seller would be our local caught fish which is delivered right to the door and prepared by our chef in a wonderful Guinness batter and then served fresh to you. One of the oldest bars in Inis Mór. The Bar radiates character and atmosphere with local musicians playing nightly peak season and every weekend off season. 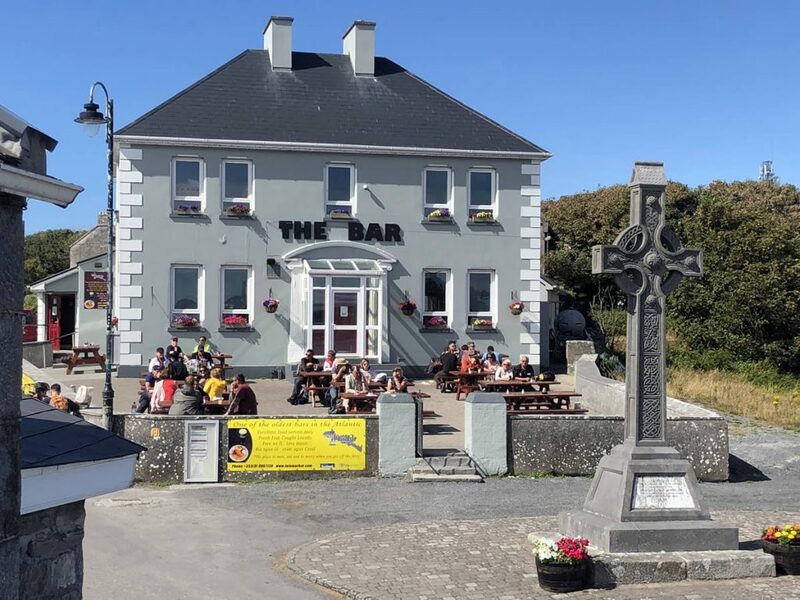 The Bar is one oldest bar in the Atlantic so why not pop in when your on Inis Mór and our dedicated staff will make your visit one to remember. Inis Mor on The Aran Islands has established itself as a boutique festival destination especially with the growing popularity of the Father Ted festival which amounts to a lot of fun and laughter. There are also a growing amount of groups coming to the islands attracted by the warm sea air of summer, beaches and just general place to have fun. We've been here before on a previous trip to Inis Mor so decided to pay another visit for an evening meal. The barman was friendly and helpful, the menu was decent, typical bar food. The food was really nice, large portions and was great value. Was happy we returned. Great place to rest your feet after a day on the island! Tasty food and cold beer hit the spot while waiting for the ferry back to Galway. if you're lucky enough to find yourself on Inis Mor on the Aran Islands, you must stop in The Bar. great views,good food,great Beer. staff is excellent. you're meet all kinds of people there,from locals,vacationers,to day tripers.you will enjoy your self! Decided to stop in while waiting for the ferry to head back to Galway. They have a full bar and sit down area to eat/drink. There’s even a great view of the harbour. Decided to get the homemade chicken goujons. It was perfectly seasoned. BEST CHICKEN IVE EVER HAD. I even ordered a second round with just the chicken. We offer a welcoming local bar serving drinks, beverages & serving food – breakfast, lunch and dinner (eat in or take-away) 7 days a week! Locally caught fish delivered to our kitchen and served up fresh to you! Kilronan, Inis Mor, Aran Islands, Co.Galway, Ireland. © 2017 Inismor Bar Aran Islands - Inismor Aran Islands Bar.